Using non-surgical rejuvenation in the form of laser therapy can be an excellent way to restore the vibrant, youthful-looking skin many individuals desire. Aging, fatigue, sun damage, and other factors can often cause a number of common skin conditions, including brown spots, fine lines, uneven texture and tone, and even scars. The Fraxel DUAL laser is designed to diminish these concerns, as well as treat pre-cancerous lesions called actinic keratosis (AK) with minimal downtime and effective results. Our board-certified facial plastic surgeon and laser expert, Dr. Eugenie Brunner, will develop a customized treatment plan that addresses both the surface and deeper layers of the skin for a smoother, brighter, and younger-looking appearance. If you have additional questions about Fraxel DUAL laser, or if you wish to schedule a consultation with Dr. Brunner, please contact us today. The Fraxel DUAL laser is a combination of two fractional laser therapies that each offer specific benefits by employing different light wavelengths. The first is the 1550 nm (nanometer) wavelength, which is designed to penetrate deeply into the skin to target acne scarring and moderate wrinkles. The second is the 1927 nm wavelength, and this mode typically offers pronounced improvement in skin tone, texture, and superficial signs of aging located closer to the surface of the skin. The Fraxel DUAL laser is highly customizable to suit the individual needs and goals of the patient, and treatment areas can include the face, neck, chest, arms, legs, and back. 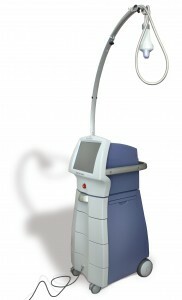 Fraxel DUAL is a non-ablative fractional laser. This approach typically offers reduced downtime and more rapid recovery than an ablative, non-fractional laser that is designed to vaporize the top layer of skin. During treatment, the areas of concern are targeted while surrounding tissues generally are left unharmed. This is intended to promote healing while stimulating the body’s production of collagen for firmer, healthier, and more vibrant skin. Patients typically can expect to see improvement in their skin tone and texture directly following treatment. Many individuals report that their skin feels softer and smoother while appearing brighter and more even. Continued enhancement should occur over the course of three to six months within the deeper layers of skin, commonly providing long-lasting results when combined with a beneficial skincare regimen. While immediate improvement is often visible after a single session, Dr. Brunner typically recommends a series of laser treatments to optimize results. She will tailor a procedure plan during the initial consultation that addresses each patient’s unique concerns and desired outcome, with consideration taken for lifestyle and downtime preferences. Following laser therapy, some redness and swelling is normal, and these effects should fade quickly over a few days. Skin will also appear lightly sunburned or bronzed after each experience, and the targeted areas will begin to peel and flake during healing, revealing the beautiful new skin beneath.